Sutherland Presses is seeking to grow our global network of Certified I-Press Specialists. I-PRESS represents the leading edge of control systems for mechanical, hydraulic, and forge presses. With a software-based platform, and an emphasis on connectivity and user-friendly operation, I-PRESS is already transforming the metal forming industry. I-PRESS comes standard with every new Sutherland press, and will soon be available to retrofit onto presses from other manufacturers. 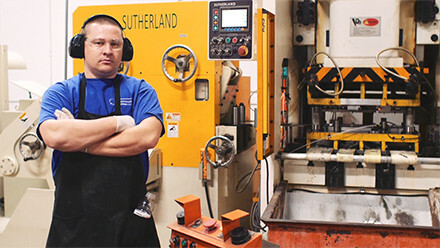 To a Sutherland Certified Press Technician, you must complete a rigorous training and evaluation program designed with equal attention to both technical knowledge and service skills. We believe that effective communication and courteous service are just as important as knowing the control system inside and out. Perform service projects for Sutherland customers, specifically for the I-PRESS control system, including new installs, retrofits, troubleshooting, and repairs. Train customer personnel on all aspects of the I-PRESS control, including operation, setup, and maintenance.